A Roman bath house thought to be part of a large villa has been found by archaeologists digging on a building site in Maidstone. The bath house was found centimetres below the ground surface on land due to have five houses built on it. The experts think the villa was probably constructed towards the end of the first century AD. Artefacts found there are being held in safe keeping until a permanent place for them to be displayed is found. Maidstone Council brought in the archaeologists after experts at Kent County Council recommended the site, in Bower Lane, be investigated when planning permission for the houses was given. 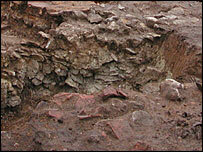 The county council's monuments record had indicated Roman pottery finds in the area. The bath house site is to be preserved under the car park being built for the new homes. In a month working on the site the archaeologists have uncovered parts of two sunken rooms - a plunge bath and a steam bath. They have also found footings outlining a small suite of heated and unheated rooms, drainage ditches, pottery, mosaic fragments and painted plaster. Beneath the villa a series of Iron Age ditches have been discovered, thought to be associated with a pre-Roman farmstead. The farm and the villa would have been on a hill overlooking a bend on the River Medway - considered an important strategic position. The archaeologists think the villa was probably owned by a well-off farmer or someone else of high status in the first century. Developer Don Crosbie, whose property company is to build the houses on the site, said: "Literally the first spade in the ground went in about three or four inches and came up against hard ground. "The archaeologists scraped away a little bit and found a Roman roof tile and that was it, within one minute of the dig on the site. "It was just incredible that it was found that early."